Speaking to Yahoo Sports, former WWE Universal Champion Roman Reigns opened up on a myriad of topics. Most prominently, Reigns expounded upon his real-life battle with leukemia being incorporated into the WWE's on-screen storylines. Addressing the same, Reigns asserted that while it did faze him to a certain extent, he'd given his permission to the company for them to use his leukemia as a part of the WWE's storylines. On the October 22nd, 2018 episode of Monday Night RAW, then-Universal Champion Roman Reigns announced that he'd previously battled the deadly disease, leukemia, and that it'd been in remission for several years. Reigns added that his leukemia had returned, owing to which he'd have to step away from in-ring competition -- Following which, 'The Big Dog' vacated the WWE Universal Championship. Fortunately, Reigns recovered from his second battle with leukemia, and made his in-ring comeback on the February 25th, 2019 episode of Monday Night RAW. 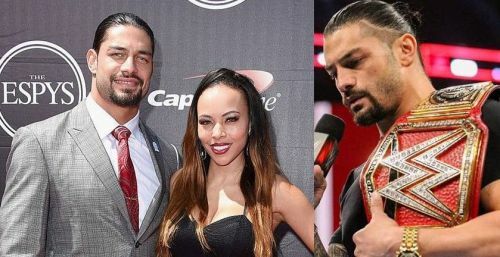 In a recent interview with Yahoo Sports, Roman Reigns elucidated that for him as a person -- Joe Anoa'i -- seeing his real-life battle with leukemia being used in on-screen angles such as in Dean Ambrose' feud with Seth Rollins, was quite hard. Additionally, Reigns noted that by including his real-life battle with the dangerous disease, the WWE as well as its talented Superstars broke down the fourth wall, as a result of which the WWE Universe's emotions were all over the place. “For me, as Joe, it was hard to tell, but as Roman, I just thought ‘next man up’ like in any professional sport or form of entertainment, the show must go on. I felt comfortable with that fact that we need to continue to entertain our fans, push these storylines and our product." The Shield (Roman Reigns, Seth Rollins & Dean Ambrose) take on the team of Drew McIntyre, Baron Corbin & Bobby Lashley in a 6-Man Tag Team Match, at WWE's Fastlane PPV on Sunday, March 10th. We, here at Sportskeeda, send our good wishes to Mr. Leati Joseph Anoa'i -- congratulating him on his successful recovery, and hereby hoping he has a healthy and prosperous life moving forward. What are your thoughts on Roman Reigns' statements? Sound off in the comments!